Buy this fantastic new cooking set now!! 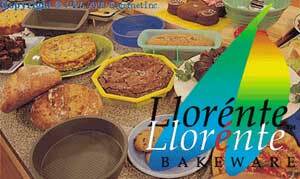 Llorente Bakeware is NOT some cheap, thin, knockoff!!! 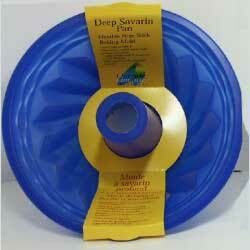 Made in Europe, Llorente is the finest quality, silicone bakeware ever invented. Llorente is made from Purflex, a non-stick, durable, and versatile material FDA approved for cooking. Llorente is convenient and can withstand extremes of temperature from the fridge to the oven with no problem. You can cook practically anything with Llorente. And it cooks so evenly and completely you will say good-bye to burnt edges and crusts. Plus, Llorente pans are great for delicious cold dishes, jells, mousse, and much more. Cleaning Llorente is a snap, just rinse it off and pop it into the dishwasher. Storing Llorente is equally simple, just fold up and pack in a drawer. In fact you can store a complete set in one drawer because its unique "memory" remembers its original shape. So buy this fantastic new cooking set now!! Llorente Bakeware has the Good Housekeeping Seal of Approval.